This morning I received a copy of the commitment letter to Vashon Island that K2 sent the King County Council yesterday. Read the whole thing because it is excellent and answers the concerns some had but the last paragraph is key. They affirm what Bakkhos/EdiPure has been saying all along, that K2 has never asked to be let off the hook and they stand by their responsibility should some environmental issue be found in the future. With this public reaffirmation from K2, hopefully those who had concerns can set them aside and our community can move forward with one vision. Viva Vashon! Posted on February 25, 2014 by Shango Los and filed under Press Release and tagged EdiPure K2. This morning we received a press release from VIMEA member Bakkhos Holding/EdiPure and we are reprinting it here so it is available to the public directly. We at BAKKHOS Holding llc, the makers of EdiPure products, found on Vashon Island what we believe to be the best opportunity to become part of a vibrant community, where our values match those of the people who will become our neighbors. Our vision to expand our operations as leaders of our industry begins with becoming a member of the community of Vashon Island, through a commitment to service, employment, and preserving the identity of the Island and protecting the environment and precious resources of the Island. To achieve that goal, we understand that becoming good neighbors and stewards of the Island means hearing the concerns of Island residents, and acting in the best interests of the community while building our new business in a new marketplace. Our commitment to Vashon Island is to ensure that our operations do not interfere with the community, but instead enhance the lives of Vashon residents, through economic, environmental, and community improvements by our presence as part of the Island. We commit to hiring Vashon Islanders first for all of our needs, whether working with us directly as employees in our facility, or as contractors for our plans to build out the building to suit our needs. We commit to engage with other businesses on the Island to create relationships to provide services for our company needs. We commit to becoming an important part of the business community by continuing our membership with the Vashon Island Chamber of Commerce and the Vashon Island Marijuana Entrepreneurs Alliance. We commit to being stewards of the Vashon Island environment and our planet by reducing the need for District 19 water through the installation of a catchment system for our cultivation irrigation needs, by immediately reducing the consumption of resources that the building has been known to use for the last five decades, and by continuously considering the environmental impact of our processes through improving and reducing our consumption of natural resources as our company grows. community purposes (if and where state and county laws allow); and through our direct involvement in events that improve the quality of life on Vashon Island. We have heard the concerns of Vashon Island, and want to ensure the community that your concerns are ours too; we will ensure that the former owners provide us with an environmentally sound property to guarantee EdiPure with a clean start for our new operations, and provide the comfort to Island residents that the company entrusting the property in our hands has protected your interests over the last five decades. We ask that those of you who are unsure if we are the right company to become stewards of the property consider that we have been open and honest about our intentions, and have provided you with a real look into who we are and what we do. We ask that Vashon Island consider that we want to be your neighbor, an employer of Vashon residents, a steward of the environment, and a real part of the community. We look forward to becoming Vashon residents ourselves, and hope you’ll accept us for who we really are, not who some believe us to be. Posted on February 24, 2014 by Shango Los and filed under Press Release, Sustainability and tagged EdiPure Bakkhos. 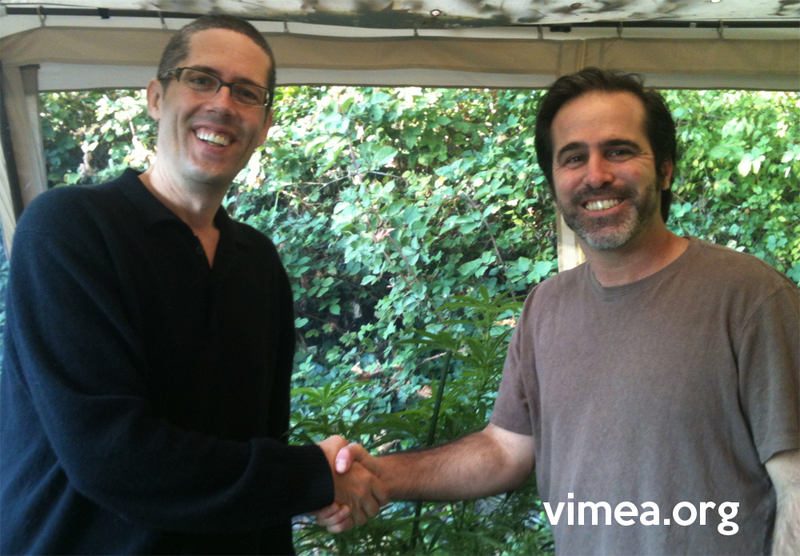 VIMEA founder, Shango Los and Executive Director Dominic Corva of The Center for the Study of Cannabis and Social Policy celebrate the agreement. Yesterday, VIMEA partnered with the Center for the Study of Cannabis and Social Policy. The Center will provide introductions to industry influencers and put us in contact with donors. VIMEA will share the strategies we've developed for integrating legal marijuana agriculture into rural America so our community organizing lessons can be used by other states soon to legalize. This partnership is a big win for Vashon Island entrepreneurs seeking markets for their products and recognizes Vashon for its leadership role in the US. Posted on October 19, 2013 by Shango Los and filed under Press Release, Partners and tagged vimea marijuana casp shango los vashon island dominic corva. Posted on October 18, 2013 by Shango Los and filed under Events, Press Release, Shango Los and tagged shango los marijuana vimea ignite seattle ignite public speaking agriculture farms farming. VIMEA founder, Shango Los testified in front of the Washington State Liquor Control Board last night regarding challenges to integrating legal marijuana agriculture into the social fabric of our community. He also pressed the Board and got the ruling rural growers can keep food crops inside the security fence with the pot because as farmers we know that an 8 foot fence isn't security as much as a big deer fence! Posted on October 9, 2013 by Shango Los and filed under Press Release, Shango Los and tagged shango los wslcb testify.